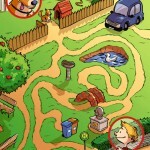 For now, this is the last maze that you haven’t seen yet. The boy comes home from school, his loyal dog already waiting for him. But what’s the fastest way to get there? 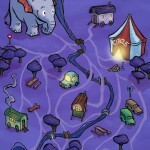 And here’s the last one of Marc’s latest maze drawings for the Junior magazine: The elephant wants to find the way to his hay because he’s hungry. But which road should he take? It’s been a while, but finally here’s Marc’s next maze. 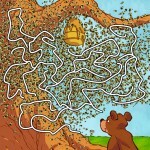 The bear wants to get to the honey, but for that he’ll have to get past the angry bees first!